Part two of a two-part series on the final months of retina fellowship. Like us, second-year retina fellows across the country are nearing the end of training. After years of medical school, internships, residencies, and fellowships, our goals are finally going to become reality. As we plan the next stages of our careers, we took a moment to talk to our mentors about what is waiting for us in the real world. Depending on the setting, new practitioners may or may not be interacting with other retina specialists or ophthalmologists on a daily basis. How do we stay up to date? Which meetings should we prioritize? Nikolas J. London, MD: I try to read the journals and attend two to three meetings a year. I would prioritize the American Academy of Ophthalmology (AAO) and the American Society of Retina Specialists (ASRS) annual meetings, and then one of the smaller meetings. Society meetings are a great way to keep in touch with friends and colleagues, get outside input, and disseminate knowledge. Chirag P. Shah, MD, MPH: Having fellows is the best way to stay on the cutting edge. Get involved with your local ophthalmic society, as well as with ASRS, the Retina Society, and AAO. 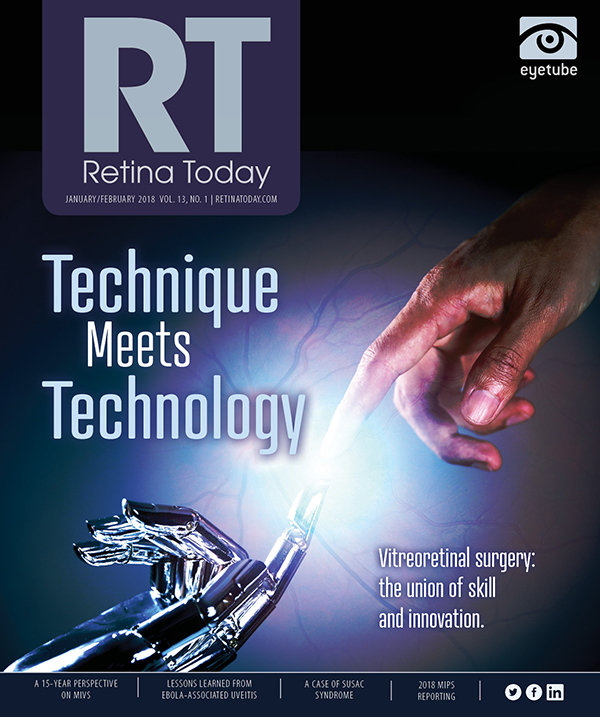 Stay current with weekly retina newsletters. Allen Chiang, MD: Try to be a reviewer for at least one journal and commit to doing that regularly. Earmark two or three articles of interest per month to start, and commit to reading those. Finding ways to contribute to committees or publications integrates these naturally. James F. Vander, MD: Attend conferences; give lectures; be an attending physician in the clinic or the OR. Being around young people who ask questions is helpful. Meetings are nice, but prioritize local engagement. Jason Hsu, MD: Don’t forget your mentors. I enjoy the occasional message from a former fellow who wants to bounce ideas off me or collaborate on a new surgical technique. Sunir J. Garg, MD: Reading the peer-reviewed literature gives you a sense of where the field is going. There are also multiple online sources with high-quality, well-narrated videos that provide a good way to stay up to date. Michael A. Klufas, MD: Keep in touch with your co-fellows and discuss cases. Staying connected is becoming easier with social media. It is great to be able to travel to meetings, but it may not be prudent to attend more than one meeting for the first 1 to 2 years. Much of this time should be spent solidifying your clinical skills and building your practice. What tips can you offer for building practice volume and a referral base? How did you develop relationships with referring physicians early in your career? Dr. London: Get out and meet ophthalmologists and optometrists. Find or create opportunities to speak in front of them (eg, presenting at hospital meetings, for industry, or at local continuing education meetings). Remember the three As: availability, affability, and ability. Rahul N. Khurana, MD: It starts with great clinical care and happy patients. They will be your most powerful advertisement when it comes to building a practice in the community. One-on-one face time with local doctors is helpful but challenging, so you have to be persistent. Dr. Shah: Take as much on-call time as possible. If you compassionately and competently care for a retinal detachment patient over the weekend, the referring doctor will send you macular puckers and age-related macular degeneration (AMD) patients during the week. Communicate regularly. Electronic health records (EHRs) can trap you into sending impersonal letters, but it is worth an extra few seconds to include a personal line or two in an otherwise standard message. Dr. Vander: Let referring doctors know that you are happy to help and that no question is stupid. Give them feedback via the communication platform they prefer. Dr. Hsu: If you’re joining a multispecialty practice, you will likely have a built-in referral base. If you’re in a retina-only group, networking with referring physicians is paramount. They will want to meet you. Much of continuing the referral pattern after that is based on how you treat their patients and whether you make yourself available for emergencies. Dr. Klufas: The traditional method of meeting referring physicians and calling them with patient updates is time-consuming, but it is likely the best approach for those 50 years and older. Younger (and, increasingly, many older) referring physicians are often comfortable with text messaging, but use a HIPAA-compliant messaging system when transmitting patient information. It is easy to get caught up in the demands, volume, and pace of a busy clinic when first starting your career. How do you stay connected to your patients and staff? Dr. London: I put big photos of my family on the walls, and I ask patients about their families and interests. It can be fun getting to know such a variety of people. Dr. Shah: Remember the reason you became a retina doctor and the concept of enough. If you love helping people on the worst days of their lives, then do so with care, empathy, and time. The concept of enough is hard to remember under pressure. When you have enough—patients, money, gray hair, etc.—limit your schedule and remember why you chose the retina specialty in the first place. Dr. Chiang: Unless you are assuming a practice, you will have time to get to know your staff and referring doctors early in the process. How quickly your patient volume builds will vary, but it usually takes 2 to 4 years to reach full speed. Use this period to connect with staff, build a referral network, and be attentive with patients. Dr. Vander: Ask patients and staff about themselves and listen to their answers. For patients, write short notes to help yourself remember the details for the next visit. Dr. Hsu: It’s a challenge to stay connected to patients as visit times become shorter. One key thing is to put yourself in their shoes. Strive to provide the best care you can, which includes not just your procedures but also your communication. Spending more time with patients during their first visit helps a lot in establishing a relationship and ensuring shorter subsequent visits. Dr. Garg: I strive to get to the office before the start of the day. Those first few quiet minutes in the morning are a chance to talk to staff about issues, learn what’s going on in their lives, and let them know what is happening in mine. Dr. Klufas: I think a good rule of thumb is to treat patients as if they were a close family member. Whether you see 20 or 80 patients per day, they value personal connection, acknowledgement, and eye contact. Your staff is an extension of yourself as a physician, and they also contribute to the patient’s overall experience. What advice do you have regarding personal finances as we transition to new income brackets? Dr. London: Get life and disability insurance early, and find a financial advisor you trust. Make sure you and your family are happy and comfortable, and then save or invest as much as possible. Dr. Khurana: You have been delaying gratification for so long that it’s tempting to want to live at your new income bracket immediately, but it will go a long way if you can be disciplined and save. Dr. Vander: Have some fun with your new wealth, but start saving early. The power of time and compounding is key. Dr. Hsu: Most of us will have spent our entire professional lives in training, with salaries that just allowed ends to meet. Once you start practice, the income bump is significant, and it tends to ramp up quickly. There’s a temptation to go crazy. Avoid this. Spend some time and money on what is meaningful to you, but it’s equally important to save. Dr. Garg: Building wealth is a fairly straightforward process. Spend less than you make, and invest the rest. If your practice or company has a tax-deferred program such as a 401(k) or you are eligible for a SEP-IRA, fund these completely. Otherwise, having a simple portfolio that you fund regularly and consistently will serve you well. Dr. Klufas: Consider refinancing high-interest student loans. If you will be driving a lot, get a car that makes you happy and is comfortable. If you have a family, there may be an urge to settle down, but buying a home is a big investment and many fellows end up leaving their first job. Rent unless you know the area. What advice can you offer regarding the business side of a retina practice? Dr. Shah: You can learn a lot from discussions with your partners and contemporaries practicing elsewhere. Dr. Vander: Some sit back and assume everything is being handled by another person. Ask questions; have a mentor or senior administrator go over financials; learn from the person who handles billing. Dr. Hsu: Physicians are rarely exposed to training on how to run a business, even though many go into nonacademic practice. If you have business-savvy partners, they can mentor you. Read what you can, keep your ears open, learn as much as possible, and don’t be afraid to reach out for advice. Dr. Garg: Ask your attendings business questions during the final months of fellowship, particularly if they are in private practice. Discuss hiring and firing decisions, opening a new office, deciding on capital expenditures, choosing a health insurance plan, ensuring proper billing, etc.